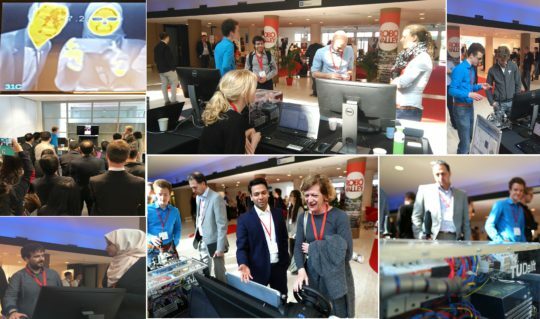 On Wednesday 19th and Thursday 20th of April, the Delft Haptics Lab was present at the combined conference of RoboBusiness Europe & TUS Expo. In the RoboValley section, we presented our work on Haptic Shared Control in car driving, as well as teleoperation. This was done through interactive demonstrations on a force feedback steering wheel and the upgraded Gemini. On Friday 21th of April we were not present at the conference floor, because the Delft Haptics Lab was part of a lab tour for approximately 30 people, including a large delegation from Taiwan. After a short presentation on the nature of haptics, we showed Haptic Shared Control on the force feedback steering wheel , and Natural Force Feedback on the HapticMaster. All in all, it was a very exciting and interesting week, and we broadened our (and hopefully other’s) minds!